Indigenous Erica’s growing at J9, with a touch of artistic license. The painting has a strong masculine left, with a gentler feminine right has side. The red flowers, smaller to balance the dominant colour, especially with the orange gold underpainting. Pink Erica flowers gentler against the softer pastel like green and blues. I used stronger pink sections to link with the red flowers. 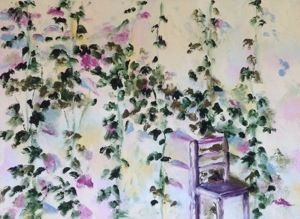 To move away from the botanical feeling of the flowers, I used slashes of background colours to break through the flowers. A series of vertical lines falling down the large canvas in a drunken stagger. An article on Colour and Composition, notes that horizontal lines suggest peace and tranquility, while vertical lines inflect the painting with strength, courage and authority. The diagonal line of the pathway adding depth, reinforced by the yellow flowers. The flowers within the forest walks have been a revelation. A profusion of red-orange aloes. Random purple and yellow blossoms, against a cascade of blue-grey foliage. Mineral Violet Light and Deep (Van Dyk No. 46 and 47) for the flower, together with an almost turquisegreen, Veronese Green (Van Dyk 67), from my magic box of paints. Security issues that have dominated the past weeks, replaced by people issues. Staff stranded in various parts of the globe after having documents and money stolen. One of the engineers admitted to the UNMISS clinic in Malakal with suspected heart problems and unfortunately not recovering. Special flight organized to get his body back to Juba and get the information to his family. Transit Guesthouse, where Jogchum has turned a blank wall into a feature by having granadilla plants create vertical lines of green. Simple, and stunning, particularly with the shadows of the foliage. The subject for a small painting. House is quiet after the departure of my staff. The mess is under control and the storm that has been threatening all afternoon continues to rumble like a bad tempered old man with gas! 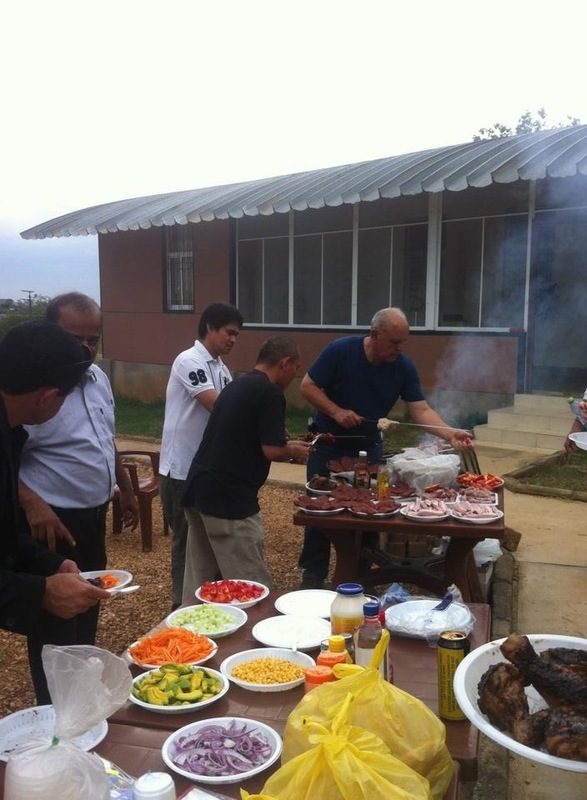 Around 27 people were here for the braai that Edit and Sher did all the hard work for. At one point we had 11 cooks around the fire from 8 nationalities and not a single South African or Australian interfering! Sher marinaded his meat in a special Afghan, or LA, receipt that involved lots of bits, including Tabasco. Tasty it was. There was a bit of concern about the lack of kitchen implements, however, Simon did a great job of putting out a whole range of salad bits, of which there were no leftovers. I don’t think anyone went home with paint on them! Juba Style, a small painting (15cmx15cm) for Van of a view over a green Juba Town from the top of Jebel hill. 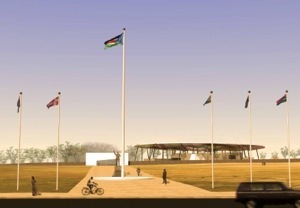 The design for the National Archive has been released. Very pleased that its the design that I liked the most. Hopefully it won’t change too much from the original concept as it goes through the detailed phases. My jog around the Juba 3 circuit, with more wild flowers out after the rains. Seemed like an impossibly long way. Painting for Aly packed for its trip to France, fridge emptied, coffee machine cleaned, linen changed, ironing sorted and suitcase packed.